Bad Breath Tester - Which one is best? If you think you have breath problems, then you need a BAD BREATH TESTER. Having Bad Breath can be a nightmare - anyone you come within a few feet of can smell a terrible odor, which you are NOT aware of yourself. And hardly anybody will tell you about this problem, because it's so embarrassing! SO you need a way of testing for bad breath yourself. 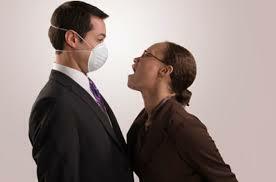 There are a couple of ways of testing for bad breath. A scientific bad breath tester is the most accurate, but also the most expensive. They are normally only available to dentists or medical facilities. But there are a few cheaper options out there. READ ON! First - what causes bad breath? Research shows that 3 sulfide compounds referred to as Volatile Sulfur Compounds are responsible for bad breath. They are hydrogen sulfide, methyl mercaptan, and dimethyl sulfide. We know that these compounds are generated by bacteria on the back of the tongue. So, let's take a quick look at a few simple ways of testing for bad breath, and why they don't work well at all. A better way is to lick the back of your hand with your tongue - but not the tip of your tongue. Try to use the middle bit of your tongue, as far back as possible. Then wait 10 seconds. Now try sniffing your hand. You may be able to detect a bad odor. Better again is to get a plastic spoon, and turn it upside down. Now try to scrape the very back of your tongue, as far back as possible. Be prepared to gag a little.You will probably be able to scrape off a little bit of white coating. Try sniffing this. If it smells bad, then you probably have bad breath. So those are a couple of unscientific ways to check if you might have bad breath. They don't work very well. For anything more than this, you will need to get some sort of electronic or digital measuring device. A Hand Held Bad Breath Tester that works! Fortunately, with recent rapid advances in electronics, you can now get a hand-held digital breath tester. I have tried out a few, and I think the new Tanita breath checker (white model) is the BEST compact breath checker. You can click on the link to Amazon to check current prices. I think this is a GREAT little bad breath tester. It's a really compact size, nice and slim, but best of all it works very well. I highly recommend it! For about $39 at Amazon, it's a bargain. If you want to get rid of bad breath, I recommend the TheraBreath Starter Kit - it's EASILY the best product in the world for eliminating bad breath! Just click on the link to Amazon. For more accurate and precise measurements, you will need to visit a dental office or clinic that has a specialised bad breath tester. There are basically two types of bad breath detector available, but they work on different principles. Gas chromatography is a very clever way of identifying which chemical compounds exist in a sample. Gas chromatographs are mainly used in big research laboratories, sometimes by dentists doing research into bad breath. This method is extremely accurate. You can measure the precise levels of each individual compound in someone's breath. While gas chromatography is probably the best way to test for the compounds associated with bad breath, it has a few drawbacks. Gas chromatographs are very expensive, and need staff with special training to operate them. The equipment is not portable, and needs a lot of time to make each breath measurement. You really don't need a full-range gas chromatograph to test for the compounds that cause bad breath. That's a bit like using a Ferrari to go to the local store. Sure, it'll do the job for you, but it's much more than you need! When it was realised that bad breath is mostly caused by just 3 sulfur compounds, somebody had the bright idea to build a bad breath tester that measures only sulfides related to those 3 compounds. That made things a lot simpler! So the Halimeter was designed to measure overall levels of sulfide gases. A Halimeter does not specifically measure the individual levels of Volatile Sulfur Compounds in a person's breath. It measures the general level of sulfides, which is an approximate measurement of the "bad smell" gases. Since a Halimeter doesn't detect individual compounds at all, but instead just measures the overall levels of sulfides, Halimeters are less accurate than gas chromatography. Also, some chemicals frequently found in mouthwashes such as alcohol and some oils can interfere with the results. The advantages of using a Halimeter rather than a gas chromatograph are that a Halimeter requires no special training to use, is portable, and breath measurements can be made quickly. Most importantly, the device itself is much cheaper. Remember we said that gas chromatography was way too expensive as a bad breath tester for a dental office? There is now one exception. The Oral Chroma is a small, portable gas chromatograph that is widely used in dental offices and university departments of dentistry. 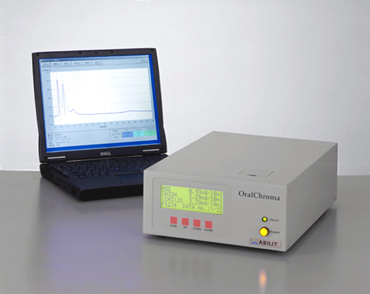 The Oral Chroma costs much less and is simpler to use than conventional gas chromatographs because it has been designed as a very specialised device, able to detect only 3 compounds - the ones that result in bad breath! The Oral Chroma measures the Volatile Sulfur Compounds hydrogen sulfide, methyl mercaptan, and dimethyl sulfide and displays each gas concentration on a computer screen. Being able to measure each component separately helps to identify the exact cause of bad breath. Then, during treatment, the dentist can check to see if treatment is working, and also lets the patient see the treatment results too. Because it is a very simple design, dedicated to measuring just the 3 gases involved in bad breath, the Oral Chroma bad breath tester doesn't need any special staff or training to operate. Anyone can operate the OralChroma quite simply and easily. After taking a sample of the air in your mouth with a small plastic syringe, it takes about 8 minutes to get the results, which can be displayed as a chart on a notebook computer. Simple! This is the most accurate bad breath tester, because it measures each gas responsible for bad breath separately, whereas the Halimeter measures the total levels of all sulfides. It can't tell you which particular gas is the worst. To be honest, it probably doesn't matter too much which bad breath detector is used - they will both give solid scientific proof of whether you have bad breath, and whether things are improving or not with treatment. The Oral Chroma bad breath tester can just give you a bit more information, if you are keen to know the exact details! I recommend it! You will have to phone around dental offices in your area to ask if they have an Oral Chroma machine. It may take some detective work! Otherwise, I recommend the Tanita Breath Checker.